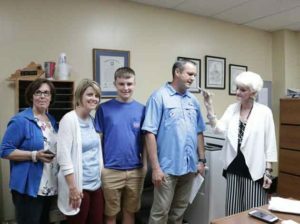 Republican Gale Cowan and Democrat Michael Stephens won their Primary contests Tuesday and will now face off in the November General Election for the office of county Judge Executive. Stephens is the incumbent and Cowan works in the judge’s office as financial officer. Cowan defeated Larry Russell Bryant with 56.34 percent of the vote, with 2,152 votes to Bryant’s 1,668. Stephens defeated Brandon “Bo” Biggs with 66.46 percent of the vote, with 642 votes, compared to 324 for Biggs. Jeffrey Scott (Scotty) Neat came on top in a four-man race for PVA on the Republican ticket, receiving 1,545 votes. Ken Hill received 1,399 votes. Jordan A. Burton received 654 and Paul W. Turner received 204. Neat will face Democrat Landon Edwards in November. Josh Brockman defeated Dallas Luttrell with almost 80 percent of the votes cast for the Republican candidate for sheriff. Brockman received 3,151 votes to Luttrell’s 801. Brockman will face incumbent Harrison Moss in November. Brockman narrowly lost to Moss four years ago by 60 votes. Incumbent Joey White will keep his job as jailer, defeating Buddy Powell with 2,822 votes over Powell’s 1,150. Brian Wright with his family and co-worker during an interview with the Wave’s Lisa Clark. Brian Wright will also stay in his position of commonwealth’s attorney by defeating Roger P. Elliott. Wright serves Adair And Casey counties and carried both counties. In Adair, Wright took in two thirds of the vote, 2,473 compared to 1,223 for Elliott. In Casey County, Wright received 3,212 votes compared to 1,110 for Elliott. Lisa Greer, a Republican, won with the strongest lead of the night, defeating Donna G. Hadley with more than 90 percent of the vote as the incumbent for county clerk. On a state level, Democratic candidate for U.S. Rep. Paul Walker easily defeated Alonzo Pennington with almost 75 percent of the vote. Walker received 51,094 compared to Pennington’s vote of 17,398. Locally, Walker earned 673 votes to Pennington’s 130. Debra Hembree Lambert and Dan Ballou will be the candidates for a runoff election in November for the Justice of the Supreme Court, 3rd Supreme Court District. The Justice is elected by voters in 27 counties. Because there were more than two candidates, the top two vote getters will run again in November. The final votes were Lambert, 63,884; Ballou, 32,192; and Tapp, 31,247. In Adair the vote was Lambert, 2,181; Ballou, 1,406; and Tapp, 1,031. Click the following link then click again on the PDF for a full view of a break-down of votes by precinct and well as overall totals in all races. Watch for this week’s Community Voice in racks and stores Wednesday afternoon for full stories and interviews with the winners.